Most people know who the first man in space was. It was, of course, Yuri Gagarin, who was also the first man to orbit the Earth. Gagarin’s flight took place in 1961, just a short period before Alan Shepard Jr. became the first American in space. Shepard’s flight was suborbital, however. It wasn’t until John Glenn in 1962 that an American orbited our planet. But most people don’t know that prior to Project Mercury, the Americans had had another plan to put men into space. It was called the Man in Space Soonest (MISS) program, and existed solely to beat the Soviets into the void. MISS’s plan involved rocket planes, most notably the X-15, which still holds the record as the fastest manned rocket plane ever flown. Amongst space geeks like me, the X-15 has a special place in our hearts. You can see a crash of an X-15-like vehicle in the opening credits of the Six Million Dollar Man. Here‘s another X-15 crash. The amazing thing about the X-15 was that it actually succeeded in putting men into suborbital space… twice. 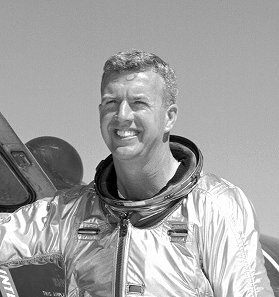 In July and August of 1963, American civilian pilot Joseph A. Walker flew the X-15 above 100km, officially earning his astronaut wings. This feat made Walker the first human being to go into outer space twice, and the first American civilian to do so a first time. He was joined in the program by Neil Armstrong, who did not take the X-15 into the realm of space, but who, of course, ended up being the most celebrated astronaut in history. Joseph Walker was killed in a crash in 1966, never seeing the culmination of the American space program on the surface of the Moon. It’s a tragedy that his pioneering efforts are largely unknown to the world. Yet he was undeniably one of the early greats, a man with truly the Right Stuff.